Candy Cigarettes: Simple Fun or Simply Dangerous? Raise your hand if you rode the bus to elementary school. Me pick me! So, yes I rode the bus. I remember standing miserable in the cold and rain. I remember how one bus driver hated kids and was constantly threatening to, “Turn this bus around.�? I remember the fights between growing boys. And I remember the smoking. The smoking! Yup smoking… In the fifth or sixth grade the “cool�? boys started bringing candy cigarettes to the bus stop. It seemed innocent enough; however, to morning commuters we probably looked anything but. A bunch of kids aged six through twelve standing around in a circle while bubble gum smoke swirled around our heads. Finally a parent commuter drove by and ended our smoking fun. Good thing too because a recent study featured in the July issue of the journal Preventive Medicine reports that kids who ‘light up’ candy cigarettes are more likely to light up the real thing when they’re older. 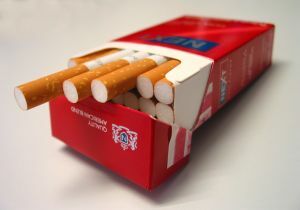 Dr. Jonathan Klein, an associate professor of pediatrics at the University of Rochester, and lead researcher on the candy cigarettes and his team studied around 26,000 adults and found that 12% of adults who had never had a candy cigarette when they were young report adult smoking habits while 22% of adults who did have candy cigarettes as a youngster report adult smoking. Also the study showed that there was a correlation with the amounts of candy cigarettes people chewed down as a kid. As kids chew more their rates of adult smoking increase. Danny McGoldrick, research director for the Campaign for Tobacco-Free Kids, brings up another point to consider. McGoldrick compares candy cigarettes with a kids learning curve. For instance first comes candy cigarettes, than with the cigarette companies coming out with flavored smokes, why not move on to that, and than on to the full blown real thing. It makes sense. I’ve heard many a teenagers state that cherry flavored or licorice flavored cigarettes must be safe because they don’t taste bad. But are candy cigarettes even around anymore? Well, I thought about that too. Personally, I thought that they’d been outlawed long ago. But they haven’t. They’re just a bit more underground. Now, with kids being so internet savvy, all it takes is a few clicks of a mouse and you can find oodles of chewy smokes on the web. I just did a few minutes ago. It was simple. Your kids will find them too. So, make candy cigarettes just as off limits in your home as the real thing. But obviously that won’t stop the bus stop kid smoking parties. The best defense is to talk to your kids early about the dangers of tobacco and then practice what you preach. To learn more about how to talk to your kids about tobacco visit Kids Health. Ball State study finds that divorced dads can stop children from smoking New Study Suggests That Divorced Dads Can Help Keep Their Children From SmokingThe Centers for Disease Control estimates that about 1 million teens — about 1 in 5 — become smokers every year but a Ball State professor has found that in the case of broken homes, nonresidential fathers can play a major role in stemming this unhealthy habit. Sociology professor Chad Menning found divorced or separated nonresidential fathers can significantly reduce their adolescent children’s chances of smoking by being a strong role model and spending more time with them. The study found that when teens are with their fathers five times a month, including overnight stays, they experience a 30-percent reduction in the probability of starting to smoke regularly. When teens spend little or no time with their nonresident fathers, the chances of their smoking increases by 40 percent. The study also found when nonresident fathers fail to provide support and develop a solid relationship with their sons and daughters, teens turn to their friends for advice and guidance. Teens with friends who smoked were more likely to start smoking regularly. Menning has spent the last several years studying the impact of divorce on American families. In 2004, he found that adolescents learn to manipulate their parents following a divorce or separation, gaining more control of their situation in a two-household family. Below is contact information for Dr. Menning and background on the study. A new Ball State University study finds that divorced or separated fathers can significantly reduce their adolescent children’s chances of smoking by being a strong role model and spending more time with them. The findings are from a study examining the long-term impact of relationships between nonresident separated or divorced fathers and their offspring, which involved 1,932 participants from the National Longitudinal Study of Adolescent Health. The study found that when teens are with their fathers five times a month, including overnight stays, they experience a 30-percent reduction in the probability of starting to smoke regularly. When teens spend little or no time with their nonresident fathers, the chances increase by 40 percent. The quality of those visits also has a major impact, Menning said. Contact Menning at clmenning@bsu.edu or (765) 285-4690. You are currently browsing the archives for the Alcohol and Other Drugs category.